Ernst was born at Ebenezer near Stockwell in the Barossa Valley in South Australia on 22nd May 1858. Ernst was the second child and the first son [of ten children] born to Peter and Magdalena Zwar. The family were renting a small farming property next to Peter’s brother Johann in the Ebenezer District in the Barossa Valley where Peter leased 80 acres at Ebenezer from John Pannach (section no. 204). They lived for a few years in a house on this property. Ernst would have attended the Ebenezer School. After this they moved several kilometres and apparently lived by the St Thomas Lutheran Church near Stockwell. Ernst’s parents Peter and Lena Zwar were foundation members of this new Lutheran congregation. Pastor Maschmedt was their first pastor. The Church was less than two kilometres north of Stockwell. In 1904 it would be replaced by a new Church built in Stockwell. There are several trees that now mark the old site on the bank of a creek. During this time Peter built a house on the farming property he had bought in the St Kitts District and it seems the family moved onto their farm in 1872. The ‘St Kitts’ name marked a District but was never a town, even though it had two Lutheran Churches, each with their own cemetery, and each congregation ran a school. The Zwar family continued to worship at Stockwell, where the children were confirmed by Pastor Maschmedt , and several were also married there by him. Ernst qualified as a blacksmith, and this trade would be his work for the rest of his life. On 20th June 1878 Ernst married Anna Ottilie Bertha Buhlmann in St Thomas Lutheran Church near Stockwell. Ernst was 20 years old and he was the first of Peter and Lena Zwar’s family of ten children to marry. His older sister Maria would marry Traugott Joppich in the same church in the same year a few months later in October. The youngest of Ernst’s siblings were the twins Otto and Carl. Ernst and Bertha initially lived in the Barossa Valley. Ernst was the only one of Peter and Lena’s family not to move north to the Appila District of South Australia. 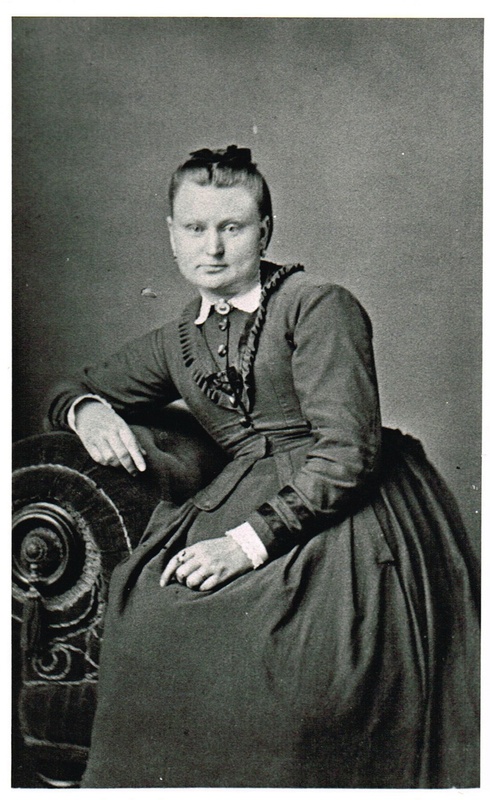 His sister Maria went north after she married Traugott Joppich in the same year – 1878. His parents and his other siblings all moved north within the next two years. Ernst and Bertha had two children. Johannes Ernst Carl Zwar was born in 1881 and Wilhelm Emil Zwar in 1885. The marriage between Ernst and Bertha was an unhappy one. They first moved to Burrumbuttock in N.S.W. where their second son Wilhelm (Bill) was born. Then they moved to Melbourne. Bertha left Ernst but the date is not certain. Ernst would later in life claim that this marriage failed because he was too young and immature when he married. Bertha was nearly six years older than Ernst. Ernst met Annie McDermid in Melbourne and Annie ‘kept company’ with him. Ernst then moved to W.A. where he sent for Annie and they were married in Albany in 1895. By that time he had changed his name to Ernest Charles Swar. Ernst and Annie had two children: Ruby Madeleine Swar, born in 1897 and Charles Ernest Swar, born in 1899. Andrew, a younger brother of Ernst also made his way to Western Australia and lived with Annie and Ernst for some time. In 1904 Ernst and Andrew both made their way back to South Australia to celebrate the golden wedding of their parents who lived on a farm at Appila. Several group photos taken at this time are the only known photos we have of Ernst. On his return to Western Australia Annie left Ernest when she found out that his first wife was still alive. Ernst became involved in several court cases regarding bigamy (which was not proved) and maintenance (which Ernest had not paid). Newspaper reports of the day give details of these cases. 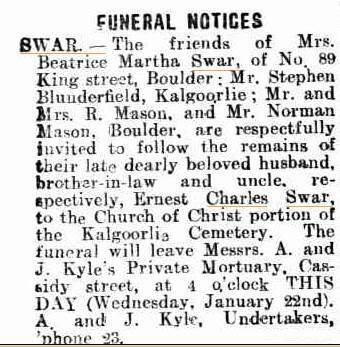 By 1913 Ernest had married again, this time to Beatrice Martha Swar (nee Blunderfield). Ernest and Beatrice lived in Kalgoorlie. Ernest died in January 1936 aged 77. He was buried in the Church of Christ section of the Kalgoorlie cemetery. No mention is made of any children from this third marriage. Ernest’s first wife, Bertha, lived with the first of their two children, Johannes and his wife Martha in Point Pass, South Australia where Johannes was the Lutheran Pastor until his death in 1932. 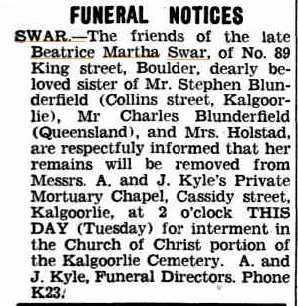 Bertha died in Adelaide March 21st 1944 aged 91 years. Their first son Pastor Johannes died in 1932 while their second son Wilhelm died in South Australia in 1955.